I’ve got a spot on Girl Scout cookie copy cat recipe for you today. The best part? It takes just 3 ingredients! 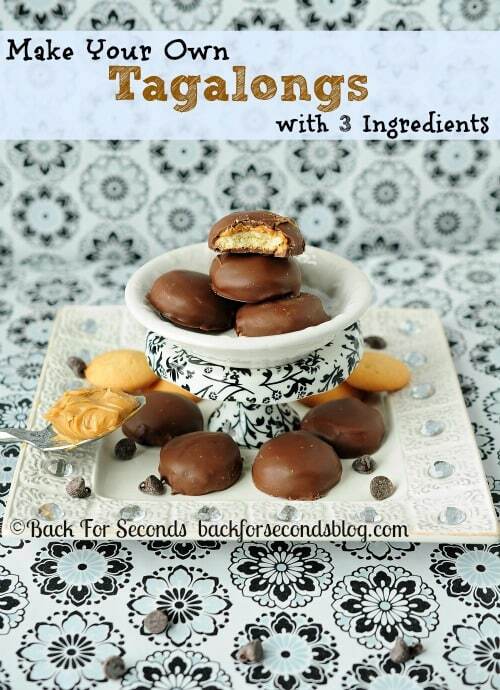 Read on Tagalong lovers, and find out how to Make Your Own Tagalongs with 3 Ingredients! I have had this idea for “homemade” tagalongs for quite some time, and now that Girl scout cookie season is in full swing, it seemed like the right time to finally give it a go. My hopes were high – was it too good to be true? Want to know my favorite thing about these? When my man came home from work he saw these and asked what they were. I told him “tagalongs“. He got all excited because he loves tagalongs. Then he ate one – it was the moment of truth. “Are these real or generic?” he asked. He proceeded to tell me that they are WAY BETTER than the Girl Scout version!! Holla! And then he ate them all, haha. I’ll admit, I’m pretty proud of myself for thinking of this, lol! It’s one of those things that’s so simple I wonder why I didn’t do it sooner! 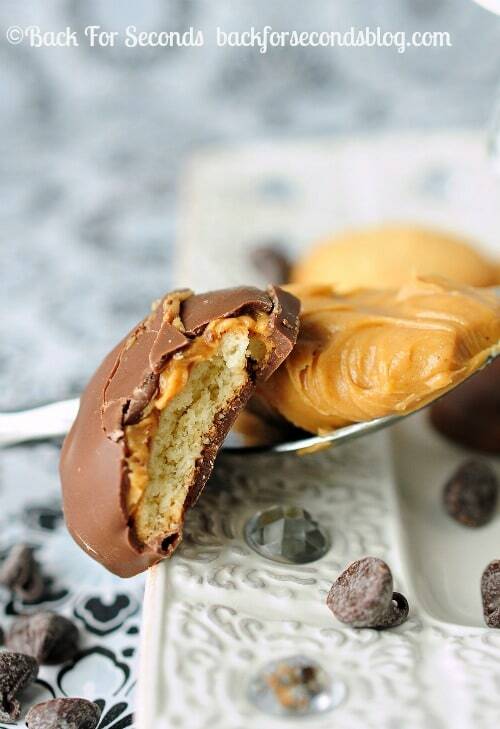 You will never buy a tagalong again after trying these. I am all for supporting the Girl Scouts, so go ahead and buy your other favorite flavors. 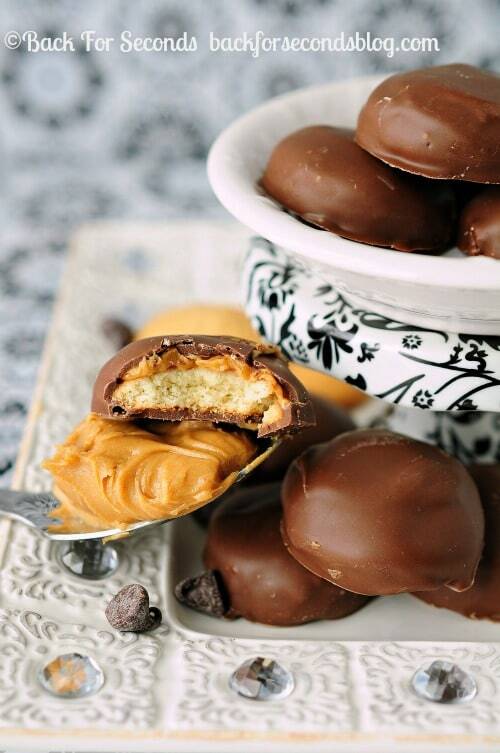 But now you can make your own tagalongs at home with just 3 ingredients – and on the cheap. You just can’t beat that! If you make these, I want to know what you think! Leave a comment or Tag me @BackForSeconds on Instgram, Twitter, and Pinterest! Can’t wait for you to try these! Now that we are BFF’s, Follow Back for Seconds and never miss a recipe! The following measurements are for making 10 cookies. I wrote it out this way hoping it would be easiest for those of you wanting to make a little…or a lot! It’s easy to double or quadruple, and easy to make just 1/2 the batch. Enjoy! Quick tip: freeze the wafers with PB on them for an hour and you’ll be able to dip them on a spoon or by hand if you don’t mind the mess. A wonderful friend of mine from work made a batch of these to take with me on a trip. They were the highlight. Thank you for sharing. I used this recipe and reposted it on my website, http://www.champagnechatter.com. I hope that is okay. I gave you total credit. I am new to the blogging world. If I need to add something about how you developed this recipe, please let me know. BTW, the Tag-a-Longs are bomb/fire/legit! I haven’t tried this recipe yet, I’m sure it will be great. I made something similar this past Christmas. I took Ritz crackers, added peanut butter on 1 Ritz, then placed another Ritz cracker over the top, so a pea it butter Ritz cracker sandwich. I then dipped them into the chocolate. I used regular and white chocolate. Sweet & Salty, they are delish. My boyfriend is picky and he loves the Ritz cracker ones, he says they taste just like the tagalogs!! I’m sure you could make them the same way with the vanilla wafers I can’t hardly wait to make them.